12.12 m of textual records and other material. Ruth Gorman was born in Calgary, Alberta on February 14, 1914 to Colonel Mark Bennett and Fleda Pattyson Peacock. Ruth received her primary and secondary education in Calgary and then attended the University of Alberta in Edmonton, Alberta. She graduated from the University with a Bachelor of Arts (1937) and a Bachelor of Laws (1939) and in 1940 was admitted to the Alberta Bar Association. Throughout her professional legal career she volunteered her services and worked on behalf of various aboriginal, political and women's groups. She was a member of the Calgary branch of the Local Council of Women as well as the Western Canada Concept party. Most notably, Gorman volunteered as the solicitor for the Indian Association of Alberta and worked with John Laurie, Howard Beebe, Chief Johnny Samson, and Gerald Tailfeathers to have section 112 from the Indian Act repealed to allow Aboriginal people to become enfranchised and vote without losing their treaty rights. Gorman was honoured with many awards throughout her life including Calgary's Woman of the Year (1960), Citizen of the Year (1961), Alberta Woman of the Century (1961) and, in 1968; she was made an Officer of the Order of Canada. She was awarded a honourary doctorate from the University of Alberta in 1966 and in 1957 was given the title of Queen Morning Star of the Cree for the work she was doing for the Alberta Aboriginal community. Gorman also had an interested in publishing and became both publisher and editor of Golden West Magazine, which ran from 1965 through to 1977. Though Ruth Gorman resigned as official solicitor of the Indian Association of Alberta in 1962, she still actively volunteered for Aboriginal issues and others in need until her death on December 10, 2002. After Ruth Gorman's death, custody of the records was transferred to her daughter Linda Gorman. The series of records related to Ruth Gorman's book about John Laurie were transferred to the University of Calgary in 2002 for Frits Pannekoek to compile and edit her writings for the book; Behind the Man: John Laurie, Ruth Gorman and the Indian Vote in Canada. In 2008 the records were donated to Thomas A. Edge Archives & Special Collections at Athabasca University by Linda Gorman. 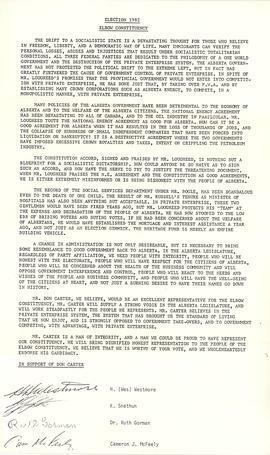 The fonds consists of textual records which include correspondence, newspaper and magazine articles and typed and handwritten notes. The correspondence is primarily letters to and from Ruth Gorman and is mainly related to her time working with Aboriginals for them to obtain the right to vote in Canada and her involvement with the Western Canada Concept party. Newspaper and magazine articles topics include, among many things, recipes, Aboriginal issues, constitution issues and prominent women. The majority of Ruth Gorman's typed and handwritten notes are related to her book about John Laurie, however, she does have notes about My Golden West, her cookbook, the Western Canada Concept party and the Local Council of Women. 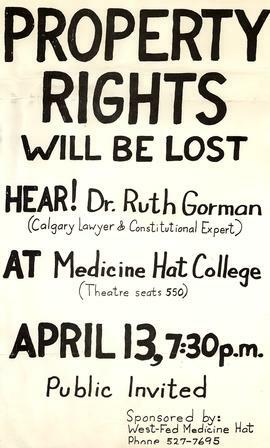 The audio materials include recordings of speeches given by Ruth Gorman to numerous groups in the province of Alberta mainly for the Western Canada Concept party. Graphic materials include photographs, negatives and transparencies, the majority of which pertain to the publishing of My Golden West magazine. Some photographs pertain to Ruth Gorman's personal life, her time on the Local Council of Women and her work with John Laurie. Artifacts in the fonds include plaques and trophies belonging to Ruth Gorman and the electronic records are mostly draft copies of Behind the Man: John Laurie, Ruth Gorman and the Indian Vote. The fonds consists of six series: My Golden West, 1912-1991; John Laurie, 1861-2006; Cookbook, 1929-1997; Western Canada Concept, 1949-1988; Personal Records, 1833-1999; and Local Council of Women Calgary Branch, 1833-1995. Some of the materials were previously arranged by Linda Gorman and Frits Pannekoek and that order has been maintained. File list and digitized material is available. Other records that pertain to Ruth Gorman can be found at the Glenbow Archives in Calgary, Alberta in the Canadian Federation of University Women. Calgary Club fonds; the Rehabilitation Society of Calgary for the Handicapped fonds; the Jean Ferguson fonds; the Calgary Bar Association fonds; the John Lee Laurie fonds; Calgary Local Council of Women fonds; the Tom Kirkham Oral History Project collection; the James Gladstone family fonds; and the Indian Association of Alberta fonds. Records can also be found in the Calgary Bar Association Oral History Project collection at the Provincial Archives of Alberta in Edmonton, Alberta. Other records related to Ruth Gorman include the Charles de Wispelaere fonds and the Olga Valda Kavaner fonds, both at the Glenbow Archives. Information about Ruth Gorman and her family can also be found in the local history books: Talk to My Lawyer by James Gray, Leven of Ladies by Marjorie Norris, Remembering Chinook Country 1905-2005, and Behind the Man by Ruth Gorman and edited by Fritz Pannekoek.